We've been delivering practical engineering education for over 100 years. We offer a range of undergraduate and postgraduate courses (HNC, HND, BSc, BEng, MSc) in civil and building services engineering and related fields, such as acoustics. Courses carry professional accreditation. The School of Built Environment and Architecture is respected by the building industry and many of our students study on a part-time basis, sponsored by their employer. The Institute of Acoustics certificate course is for technical and scientific staff, whose employment requires them to gain a working knowledge of noise or vibration measurement. Short course, 5 days full-time. The Institute of Acoustics Diploma provides sufficient specialist academic training to satisfy the educational requirements for Membership of the Institute of Acoustics. Accredited by the Chartered Institute of Building Services Engineers and the Institute of Acoustics, this acoustics masters is a step towards Chartered Engineer Status. Study full-time or part-time. Accredited by the Joint Board of Moderators for Chartered Engineer Status. 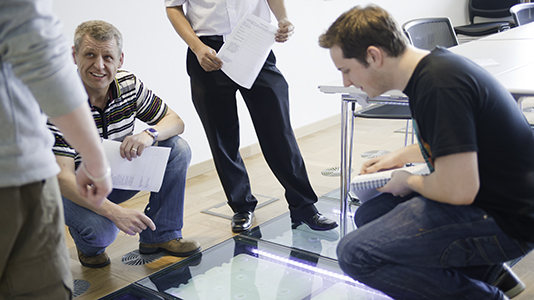 This advanced postgraduate course covers structural analysis, design and structural computing. Offered full-time and part-time.